Saturday was a damp and rainy day so I hit my favorite haunt early in the morning and then met up with Sis for lunch and some "Goodwill" hunting. Part of the fun is the chase and I'm always fascinated by what treasure pops up. First find of the morning was this lovely Victorian Persian rug. Hand knotted and vibrant colors make this a pretty little decortive piece. I love these tapestry doilies. Patinaed gold bullion lace finishes this pretty little doily nicely. I can sell footed compotes all day long and this lovely Reed and Barton will be no exception. This was a Goodwill find. How sweet is this set of Victorian apothecary jars? Hand painted and marked Gauze, Cotton, Aspirin and Vitamins. Adorable vintage Jolly Jinks child's plate. The skiing bears in the center of the plate have long since been washed away, but their ghost images live on with the dancing squirrels and rabbits around the plate. 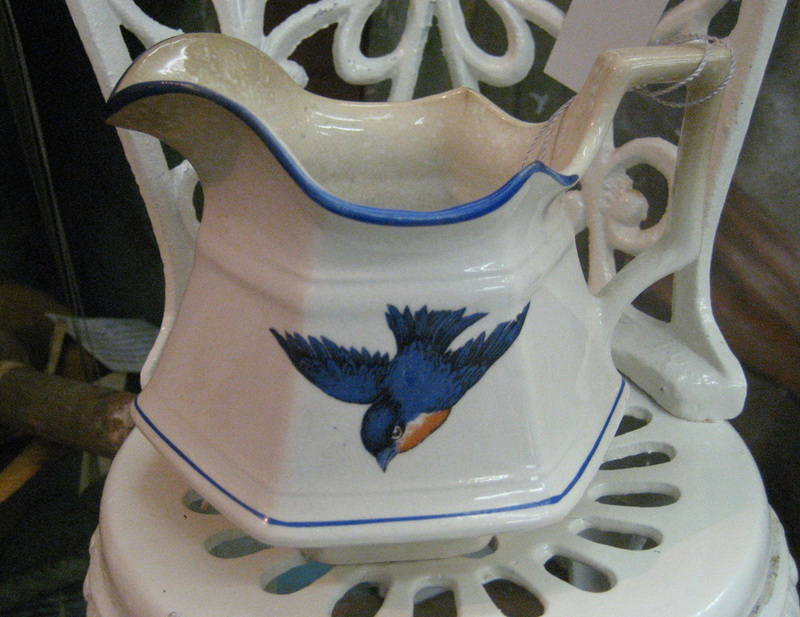 A huge and very heavy antique splatter ware pitcher. The palest shades of mint green and browns accent this pitcher. Found a huge bag of fruits and vegies at my local Goodwill. They are sturdy with a nice weight and look like the real thing. Pears and apples accent a vintage copper hammered tray, coffeepot and sugar and creamer. Faux peppers and avocados look like the real thing and are such fun to decorate with. Another Goodwill find, this great hand made paper shade table lamp. A lovely, Alexandria Reed crystal diffuser. Rich purple tones in a heavy crystal. Hey Loosey! You have some es'planing to do. Brilliant red polished cotton apron with a side oven mitt with pretty roses. Very 1950s. 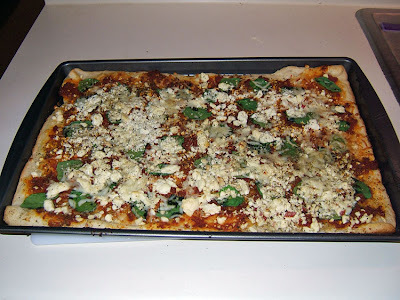 When my honey and I were visiting grandchildren in Aurora, Colorado, they brought home pizza from a chain called Papa Murphy's. What makes this pizza chain unique is that they do not bake the pizza, they just prepare it for you to take home and bake completely there. 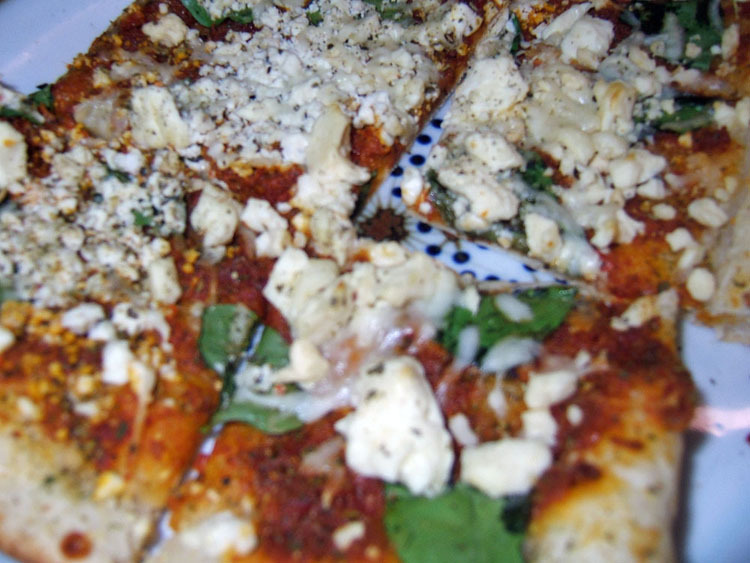 One of the unbaked pies they brought home was something called a Mediterranean Pizza. I'm a pizza purist and I'm not into weird pizza pies with pineapple or ham or kiwi fruit. 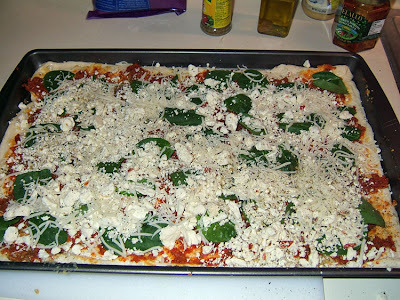 All I heard was spinach and thought, here we go, another strange pie. As the pie was baking it smelled exactly like the pies we would get in Vincenza, Italy so I was thinking this may not be so bad after all. When they took it out of the oven I saw it was filled with sun dried tomatoes, spinach, feta cheese and garlic and oil on a crisp crust. I was in heaven. We don't have Papa Murphy's here in Atlanta so I had to replicate it. 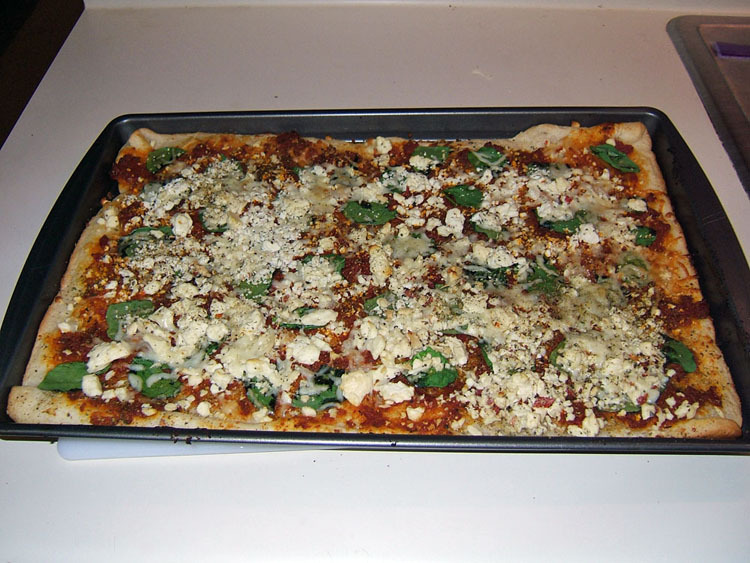 Using a cookie sheet or a large round pizza pan, sprinkle breadcrumbs or corn meal in the pan and then lay the pizza crust in the pan. Brush dough with olive oil and then smear the crushed garlic all over the dough. 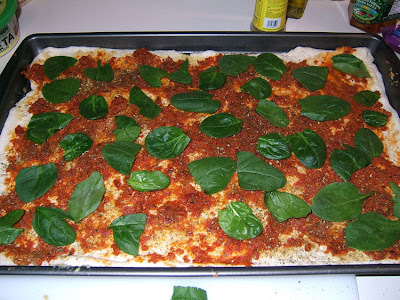 Using entire jar of sun dried tomatoes, cover the dough and then sprinkle with Mrs. Dash Italian seasonings. The smell of the sun dried tomatoes and the garlic is heavenly. Now place fresh spinach on the pie. Cover pie with the feta cheese and sprinkle a little bit of the shredded mozzarella (less then 1/2 cup). Now bake for about 15 minutes. A lovely three day weekend found me local junkin and found some interesting items. This left me with bringing "in" items and as I worked displays, they moved "out" just as fast. It was a chilly weekend here in Atlanta and Sunday afternoon found the Queen of Hearts mobbed with shoppers. What would normally take me a few hours to set up displays and fluff up my booths, took twice that amount of time as I worked around customers. No complaints from me though, every time I turned around a piece moved out of my booth. 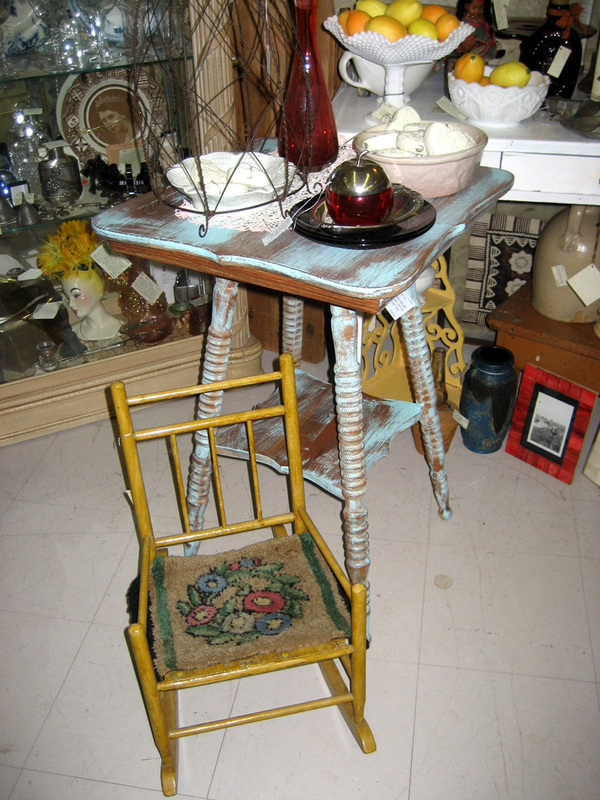 Brought in this sturdy and beachy blue distressed oak parlour table to replace an end table that sold. I had just finished setting this display up when a lovely woman named Sue fell in love with it. So in the booth for 20 minutes and out just as fast. I would have hung this sign in my sons bedroom if they were still little ones. It is huge, nearly 4 feet in length and the palest shade of french blue with incised lettering. I had just snapped this photo when a customer snagged it and took it to check out. 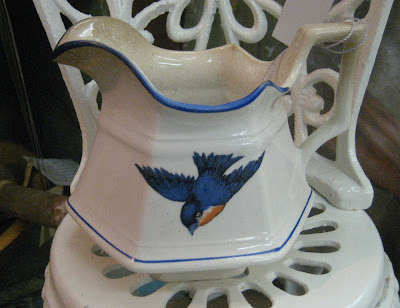 How sweet is this pretty little bluebird soft paste creamer. The bluebird was a highly popular theme in the 1900s through the 1920s. Yup, this sweetie flew the coop shortly after bringing it in. Got the "Sassytrash" itch and couldn't resist this sweet little wire birdcage. So many possibilities. Remember this birdbath with feeder I found a few weeks back? Well, I cleaned it up and gave it a fresh coat of copper bronzing paint and I love love love the finish. Pretty Tiffany style stained glass votive candle cover. Hey Lucy!!!! Fantastic brilliant red organza with pretty Valentines hanky pocket. Very 1950s. I've had this pretty little satin heart box with pretty petite point cover in my house for years. Time to share it with another heart lover. Goofus Glass bulbous rose vase. Usually covered in gold/red cold paint, this now sun purple vase looks so much prettier. Perfect for cut flowers all year long. I moved this sweet face from my main booth to the Victorian booth. He looks happier there. I love these Victorian through Depression era Cupid Awake/Cupid Asleep prints and will buy them whenever I can find them for resale. I think they make the perfect valentine. Brilliant red Jack in the Pulpit vase. Victorian favorites, someone turned it into a lamp base by drilling a hole at it's base. Sigh, another antique mutilated by an unknowing individual. Still, it is lovely. Two interesting finds. An Arts and Crafts, hand hammered measuring cup and a silverplated chalice. It's that time of year for antique Valentines and I have a few placed throughout the Victorian booth. They always make me smile and I love the beautiful Spencerian script of the giver to the receiver inside. This Valentine is a real beauty and stands almost 14 inches high. And finally, a spectacular hand needlepointed wool rug. A lovely Victorian reproduction, this would look smashing in anyone's home. 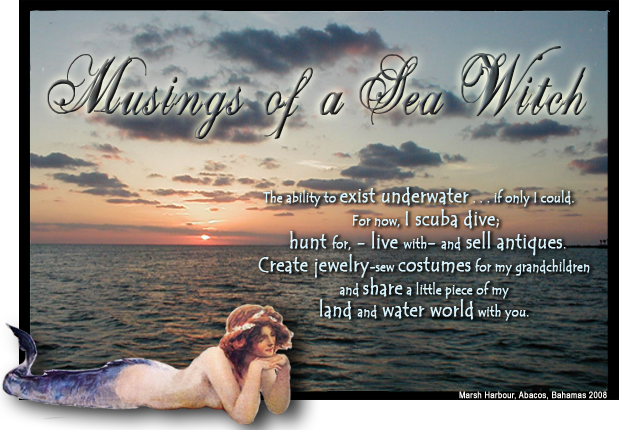 So it was a great weekend for finding treasure. Now on to the replacement flooring in my little home. Have the laminate folks coming tomorrow so I have to prep two bathrooms, a laundry room and our kitchen tonight. Have to follow up with the carpet replacement next in the living room, dining room, master bedroom and hallway. I don't even want to think about moving those rooms right now. Hello Everyone. 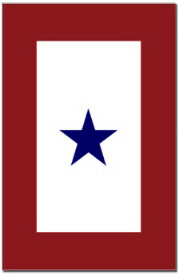 Another family member is downrange in the middle east so I continue to hang the Service Flag out my window at home. God speed, Kirk. I keep the service flag up to honor those who continue their service and I pray they are safe as well as their families. Everyone knows someone who has family or friends or coworkers in the active military or downrange. Yesterday, I came across a few boxes of the yellow ribbon "Support Our Troops" magnets at my local Goodwill and bought them all. It's that time again where I'm feeling the need to do a total redo of my booths. This would be more fun if it wasn't so difficult as we can only work our booths during business hours and we must keep the pathways clear and cannot move items temporarily into other booths...in otherwards do not impede the flow of customer traffic. So what we are left is taking stuff out, putting it in our vehicles and then moving things, going back to our vehicles and then restocking again. Sigh. So that meant moving my lighted display case to inside the booth. Wasn't really keen on that idea, but while I was working, customers had to walk "into" my booth to get to the case and the light drew them in like bees to honey. This may work out after all. Brought in lots of new "old" transferware. Got lucky at my local Goodwill of all places and was able to restock for pennies. Kept two pieces for myself, I have a thing for large, soft paste platters. Moved the vintage kitchen table and this opened up the center of the booth and made items more accessible to the buyer. Brought in a child's quilt that was made with Captain Kangaroo fabric from the 1950s. It's a happy vintage textile. Other neat items that I found was this pair of cast iron mermaid doorstops. Not old, but nifty just the same and perfect for a sea witch booth. This jumbo size metal leaf in a verdigris finish is perfect for displaying burning candles or better yet, put it on your coffee table and fill with your electronic remotes. Those are dinner plates sitting in the middle of that leaf so you can see just how large this leaf is. My pretty little rocker with the hooked rug seat is too sweet. Delightful little ruby red glass apple with silverplated top is a vintage sugar bowl from England. Adorable little vintage pressed glass syrup pitcher of a log cabin. A marvelous find. Fenton "lavender satin" bird of happiness. Rare lavender changes color with lighting like the alexandrite stone. From rich lavender to a ghostly opal blue or white, this is a neat find for the Fenton collector. Nothing says elegance like Lladro porcelain. Found this magnificent piece at a local haunt for pennies all because she has a few broken fingers on her back hand. This retired piece still has value with the damage and can be restored returning it to its greater value. Sweet set of eight saucers from Royal Doulton. Pretty roses pattern. I adore hand colored prints and this "Gay 90's" lady looks lovely in her sassy hat and hand muff. Pretty original oak frame with metal scrolling and bubbled glass. Came across a bag full of bisque hearts and thought they would make pretty bowl fillers. They can be hung as well and would look pretty in a window. Sis found this great piece while visiting friends in Tallapoosa, GA a few weeks ago. Gotta love smart phones, she sends me a pic and we close the deal over the phone. I delight in the fussiness of Victorian protocol. If you "came to call" and I was indisposed or not at home to greet you, then you would leave your "calling card" on a tray specifically created for this social grace. This pretty Victorian calling card tray is faboosh with mythical figures cast on a heavy bronze. If you must leave your calling card, then do so on a pretty footed tray. Not old, but so pretty with the dragonfly motif. 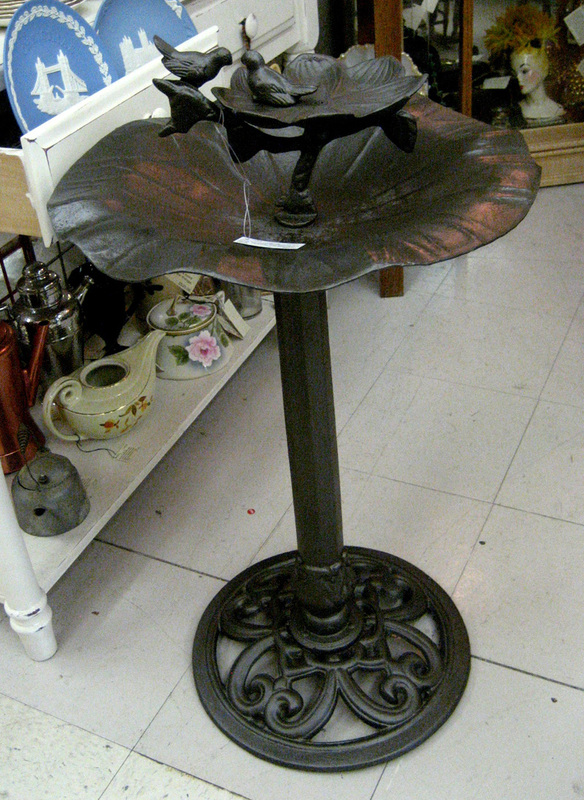 This little votive tiffany lamp is perfect for bringing Victoriana to your patio or desk.